News, accounts and information regarding Portland Mountain Rescue missions, events and activities. Are you ready for another great kick-starter to the 2019 adventure season?! 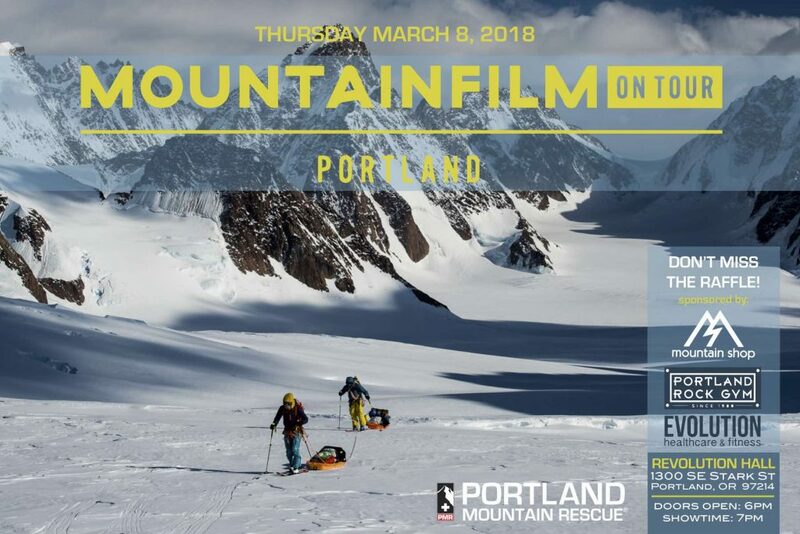 Portland Mountain Rescue will be hosting Mountainfilm on Tour at Revolution Hall! Enjoy an epic evening watching humorous, exciting, and inspirational adventure films while getting in on some of the best raffle packages around. And what makes it better? Meeting, mingling, and sharing stories with the many amazing people in Portland’s outdoor culture. 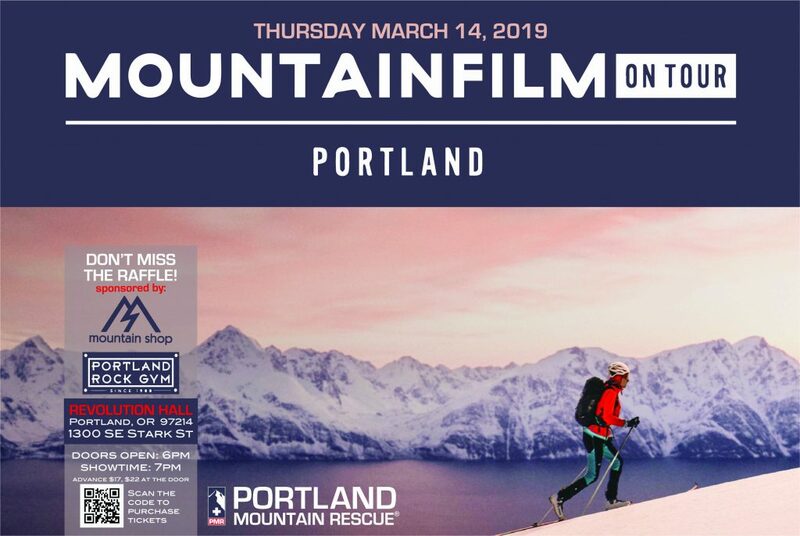 All proceeds go to support our non-profit mission of “Saving lives through rescue and mountain safety education.” Save the date, Thursday March 14th, 2019. Doors will open at 6 pm and show starts at 7 pm. Ticket prices are $17 in advance and $22 at the door. Sponsored locally by Mountain Shop and Portland Rock Gym . All proceeds from the event benefit Portland Mountain Rescue. Tickets are $17 in advance and $22 at the door; available online from the link below. A treewell is a ring of fluffy, unconsolidated snow that forms around tree trunks. The boughs of the tree shelter the area, so not as much snow accumulates there. The bows also block sunlight, so the snow does not consolidate well, even several days after a big dump. What is the Risk to Skiers and Riders? Skier gets too close, the snow gives way and they tumble. Because they are attached to their boards, their feet stay near the surface, but their head and torso sink into the fluffy snow. Once that happens, it is extremely difficult to get out. Several years ago, a Canadian group did a study where a bunch of fit college kids jumped into treewells. 90% of them could not get out without help! And Then You Freeze to Death? The risk once in a treewell is that you will suffocate. Snow packs in around you and can freeze to form a death mask of ice. Or you can inhale so much fluffy snow that you drown. This can happen in minutes. If you don’t suffocate, you’ll have a couple of hours before you are overcome by hypothermia. What can you do to Survive? Grab hold of the tree to prevent sinking deeper. Pack out an air space around your face. Don’t struggle; that causes snow to pack around you more. Use the tree to raise yourself if you can. Release your bindings if you can, but you usually can’t reach them. Otherwise, conserve your energy and wait for your buddies to find you. First, recognize the risk. Always ski with a buddy and keep your buddy in clear view. That means skiing side by side like in dual slalom. If your buddy is behind you, you can’t see them fall in a tree well. Carry an avalanche beacon, shovel and probe. Don’t use pole straps so that your hands will be free to move through the snow. You also can wear an avalung or other emergency breathing device. Steve Leavitt, a 57 year old skier from The Dalles, was skiing with his brother at Mt Hood Meadows on Tuesday, March 7. The mountain had received several feet of new snow in the previous days, and deep powder conditions made for exhilarating, but challenging skiing. Steve’s brother called it a day early, but Steve kept skiing. His lift pass was last scanned getting on the Heather Canyon lift at 11:20 a.m. When Steve didn’t return home that evening, his family was worried and reported him missing about 7:30 p.m. His family indicated that he was not carrying an avalanche beacon, climbing skins, food, water or any equipment for a night out. Ski patrol searched for Steve that night, and the Hood River County Sheriff requested assistance from Portland Mountain Rescue and the Crag Rats for Wednesday morning. Search crews focused on areas served by the Heather Canyon lift. Steve’s family reported that Steve was an experienced skier who liked to ski the steep trees of Jacks Woods and Private Reserve, and he knew the area well. His car was still at the Hood River Meadows lot, but contained no clues. So the search area included the Clark Creek runout that returns skiers from Heather Canyon to the parking lot. Search efforts were complicated by 17” of fresh snow that had fallen since noon on Tuesday. The snow covered all clues and made for dangerous avalanche conditions. Searchers focused on tree wells where clues or a body could be buried. They skied slowly from tree to tree and tried to probe every tree well with potential. Searchers also scanned with a Recco receiver although it was not known if Steve’s clothing included a Recco reflector. Efforts to ping Steve’s cell phone were unproductive. No clues were found on Wednesday. So the search continued through Saturday with rescuers from Portland Mountain Rescue, Crag Rats, Deschutes Mountain Rescue, Corvallis Mountain Rescue, Mt. Hood Meadows Ski Patrol and others. Mountain Wave provided communications and GPS tracking assistance throughout the search effort. Formal search efforts were suspended Saturday afternoon. Mt Hood Meadows Ski Patrol and others continued the informal search into the following week. After some surface snow melted, ski patrol finally spotted Steve’s helmet at the snow surface late on March 15 and his body was recovered the next day. Steve apparently had collided with a tree and suffered trauma. He had come to rest in a tree well, and the heavy snow had fully covered him. Steve’s body was found in an area where searchers had made multiple passes and had probed tree wells without finding him, which is testament to the difficulty of searching under these conditions. Our hearts go out to Steve’s family and friends. We encourage all back country travelers to enjoy their adventures with a friend or two and not to recreate in remote areas alone. Tree skiing is both challenging and rewarding, but if you need assistance you will be hard to see or hear unless a buddy is close by.